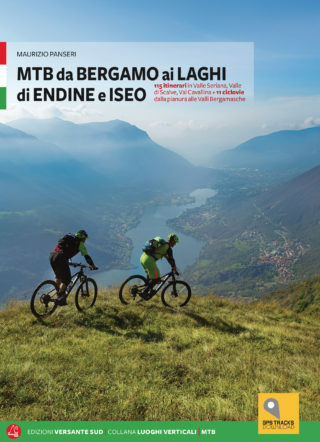 Mountain biking from Bergamo to Endine and Iseo lakes. This guidebook features 126 suggestions: should you cycle all of them, you’ll have explored almost 3.000 km on your bike. It would be a journey from an altitude of 120 mt – the Navigli – to 2.612 mt, at the Caronella Pass. The detailed descriptions, the accurate elevation profiles and maps and the GPS tracks (download included with the book) will help you to find your way; moreover, you’ll have the chance to wander through the tales, the pictures, the suggestions scattered all around, encompassing virtually every route. The graphic layout is clear and effective: every route is summarized on a spread page, and then described in detail. The routes have been grouped in 13 homogeneous geographical areas, which will help you to choose and cast a wider view on the different valleys and sub-sectors, designing link-ups and variations according to your taste. And you’ll be able to choose also according to your technical prowess and fitness, including several proposals suited for family trips with children. 11 cycleways, stretching for 346 km, are described and will help you with the transfers from the lowlands to the alpine pastures, woods and passes. Every proposal is a ring-route, thus allowing for easier logistics, totalling 2.587 km in lenght and 110 km in elevation gain. One of the most interesting new features is the chapter dedicated to the cycleways linking Milan with the valleys of Lecco and Bergamo: they are an interesting and essential tool for a sustainable mobility, allowing to reach the mountains from the city and the lowlands. Unfortunately, these cycleways are not homogeneously managed, they feature different signage and rules, yet it’s a first step towards an integrated cycling network. Maurizio Panseri, born in 1964, lives in Olera for more than 20 years. Olera is a small historical hamlet in the woods around Alzano Lombardo, a few kms from Bergamo. He’s been a passionate mountain-goer since his teenage, exploring the whole alpine range; yet Orobie and Bergamo Pre-Alps are his homeground. Besides mountainbiking, he’s a keen alpinist, skier and climber. He’s fond of relating and sharing his adventures and experiences, collaborating with several specialized media outlets. You can find his “Little tales” and his reportages on www.vertical-orme.tv.